It happens all the time. A parent takes their baby to a local restaurant just expecting they’ll have a good booster chair. Once the chair is brought to the table, it’s filthy, it has no harness, it’s too high or low, and your child is uncomfortable. One of the best ways to bypass this frustrating situation is to purchase a cozy portable highchair for your child. Owning your own chair is the most convenient way to take your child on the go and ensure that they’re safe, comfortable, and clean for mealtime. Millions of dollars are spent each year by parents who buy products that don’t end up working out for their baby. Don’t be one of them. We’ll explore the favorite portable highchairs, discuss their design elements, and help you to narrow down your search. There are many kinds of portable highchairs out there that come in a number of shapes, sizes, and colors. To ensure that you’re getting the performance that you want, it’s a great idea to explore what’s out there, research which chairs are most popular, and understand the beneficial features that they provide. We’ll explore the favorites, discuss their design elements, and help you to narrow down your search. When purchasing any product for your baby, it’s always a great idea to do your homework and really see what’s out there. Millions of dollars are spent each year by parents who buy products that don’t end up working out for their baby. Don’t be one of them. The goal of purchasing a portable highchair is to make your life easier, and your baby’s life more enjoyable and safe. It is important to veer on the side of high quality. For the most part portable highchairs are quite affordable, and some of the best ones are mid-range in terms of price. So, no need to spend a fortune, but don’t be cheap either. After all, when it comes to the safety of your baby, nothing else compares. Traveling with your baby can be stressful, or even just taking your child to a local restaurant or cafe can be so. Make venturing out easier with the convenience and comfort of the Chicco high chair. Designed in a vibrant red color, this portable high chair wipes clean easily thanks to the durable nylon material. One of the most popular portable high chairs on the market, the Chicco weighs a feather light 7 pounds, making it easier than ever to take your child’s favorite chair on the go. The seat features rubberized grips that will never mark tables or pinch delicate fingers. The chair is also designed to easily negotiate table skirting of up to 5.5 inches, making it compatible with pretty much any table you’ll encounter. It’s incredibly handy to have this high chair with you when you encounter a restaurant where there are no highchairs, a picnic bench for an impromptu lunch, or any other solid table where you want to place your child in perfect proximity to the eating area. This ergonomic seat was designed in Italy, has a stylish appearance, and folds compactly for easy storage. Also, thanks to the 3 point harness, you can rest assured that your child is seated safely. The popularity of the Chicco makes perfect sense when you take into account its smart, streamlined design and durable materials. This is a portable high chair that is guaranteed to stand the test of time, making traveling easier and mealtimes more fun for you and your baby. Constructed from only the most lightweight and easily cleanable materials, you’re going to wonder how you ever traveled before without the Chicco on hand to give your baby a comfortable resting place. 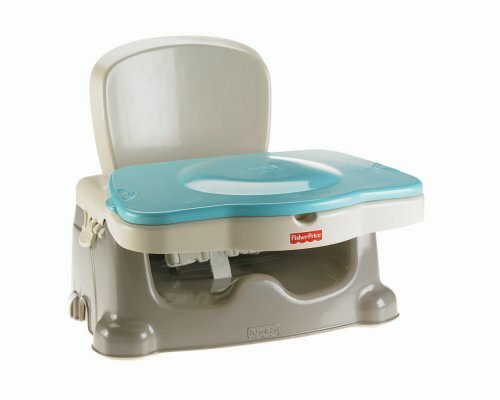 This deluxe booster seat from Fisher Price comes with a convenient feeding tray that can be easily sanitized in the dishwasher. The easy snap-on lid perfectly positions the tray, and entire seat can be taken on the go. To carry it with you, simply fold it compactly and place it in an overnight or baby bag. You’re going to be surprised by how lightweight and easy to carry this deluxe booster is. Also, the pleasing brown and tan design with blue tray looks stylish and sophisticated. Enjoy extra features such as three height adjustments to choose from for a perfect custom fit to any table. Also, the front and rear seat straps will adjust to the size of any chair, and three point harness will accommodate your growing child, always keeping them safe and secure. The entire seat folds compactly for the ultimate in portability, and the convenient carry strap allows you to take the seat anywhere. In fact, you’re going to find that this is one of the most portable highchairs on the market, which comes as a surprise considering the added benefit of having a removable feeding tray. All in all, parents absolutely love the convenience and style of this portable booster, and its built from durable materials that are easy to clean and sanitize. Whether you’re constantly on the go with your child, or you simply don’t trust the booster seats provided in public spaces, you’re going to enjoy how much easier and more comfortable this booster makes your life, adding enjoyment for you and your baby at meal times. The Summer Infant is designed for the ultimate in portability. In fact, this booster seat is so compact that it’s even possible to put it in your overnight bag. You simply open and unfold the seat in seconds and you have an immediate strong, sturdy, and perfectly safe place for your child to sit at the table. Ideal for those who don’t totally trust the highchairs provided at local restaurants and cafes, or for those who merely love to travel, this travel booster will provide you with all the comfort and convenience that you crave. A great choice for families on the go, the Brica is one of the most trusted portable booster seats on the market. Within seconds you can convert an adult chair into a comfortable and sturdy place for your child to sit and enjoy their meal. It comes equipped with a three-point built in harness that keeps your child safe at all times, and the adjustable straps allow you to quickly attach the booster to virtually any adult chair. Constructed from the most lightweight materials, this booster completely folds for easy storage, and the double stain resistant fabric makes cleanup easier than ever. It should be noted that the Summer Infant is intended to be used for babies who are at least 6 months old and weigh up to 37 pounds. Should your baby fall into this category, then you’re going to be amazed by the comfort and convenience that this chair provides. Whether you travel a lot, or you simply want an option to carry on the go just in case, you’re going to find that you don’t even notice you have the Brica in your bag, it’s so lightweight. Experience for yourself why families absolutely love using this portable highchair. We’ve explored some of the most popular portable highchairs on the market. The benefits of these chairs are clear and dependable, and each chair shares much in common. That being said, you can see that these chairs are also quite different, and provide various features that are beneficial to some, and unnecessary for others. As you explore the world of portable highchairs to find the right model for you, it’s important to arm yourself with knowledge. You want to have a good idea of what your priorities and needs are, so that you can better find a booster that fulfills these needs. Next we’re going to impart some basic information about portable highchairs, what some of their main features are, and some pitfalls you might want to avoid when purchasing one. Reading reviews is an amazing way to get a sense of how actual parents use and benefit from these chairs. You’ll also read words of caution that will help you to steer clear from boosters that do not deliver what they promise. As you read the buyer’s guide below, be sure to ask yourself the most important questions, such as how often and in what way you plan to use your booster. There’s no sense in buying a top rated highchair simply because it’s top rated. We all have unique needs, and it’s guaranteed that you’re going to be able to find a travel booster that fulfills these needs. It’s always recommended that you make sure before purchasing that your child is the appropriate size for the chair, and always keep receipts in case there are defective parts. That being said, let’s get started on exploring your options. Even if you’re at a picnic, feeding your baby isn’t a picnic. Owning a great highchair can make the experience much easier for both you and your child. The beauty of owning a portable highchair is that you can bring a comfortable, clean, safe place to sit no matter where you go. This familiarity is good for a child, and helps make mealtimes more enjoyable. When it comes time to select a portable highchair, take heart and don’t be overwhelmed. There are literally countless models out there to choose from, and above we discussed some of the most popular models on the market. What you should really take into account when searching for the perfect portable high chair for your child are the safety features. Certainly, you need a good harness and restraint system, as well as straps to securely connect the booster to the seat or table skirt, dependent upon the design. Also, for those models that fold, you want to make sure the chairs won’t scissor, pinch, or shear you or your baby’s fingers. Portable highchairs are made of all sorts of materials, and also come loaded with features such as adjustable trays, reclining positions, and height adjustments. The more adjustable the chair the better. Because you will encounter so many different kinds of tables and dining situations, the easier it is to have the booster accommodate these situations the better. You also want a chair that is flexible enough to change as your child grows in size. At the very least, you need a chair that is stable and sturdy. It’s great to have a highchair that is made of lightweight materials so that it’s portable, but you still must make sure that this chair is stable and safe. It may even be prudent to choose a chair that is a tad heavier to get more sturdiness from it. Also, consider that the chair will most likely endure heavy use, spills, and a few hard knocks. Be sure to find a booster that is strongly constructed. You would think that there would be only a couple types of portable booster, but there are many. Consider whether you want a booster that is secured to an adult chair and comes with a tray, or a booster that securely attaches to the table so that your baby is almost eating like the rest of the adults. There are those that fold, and those that are simply feather light and do not become so compact. With all the different incarnations, it’s important to zero in on reviews by customers, and take note of how simple or complicated the fold-down process is for that chair. A few things to keep in mind before you go out and purchase a portable high chair: Make sure the chair that you are considering will suit your needs. Are you in need of a booster that folds flat? Does the design and appearance of the chair matter to you? Is it necessary that the chair take up as little space as possible? Answering these questions will help to steer you towards the appropriate highchair for you. Portable Booster Chairs: Similar to a highchair, a booster chair is designed to attach to a regular dining room or kitchen chair. It’s basically a highchair but without the legs. The booster comes with a number of features such as reclining and adjustable height options, as well as padded seats and back. 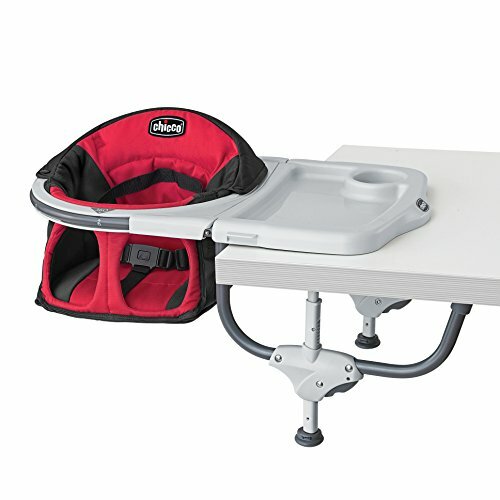 This is a great choice if you are on the go, or you simply don’t have room for a full highchair. It’s easy to toss a portable booster in your car, or even fold it and throw it in an overnight bag. Keep in mind that not all travel boosters are the same, and some are quite bare bones without the more advanced features mentioned above. Portable Hook-on Chairs: If you travel a lot with your little one, don’t feel like lugging a booster seat along where you go, and you don’t happen to be a fan of restaurant highchairs, then these portable seats that hook onto tabletops are a great option for you. 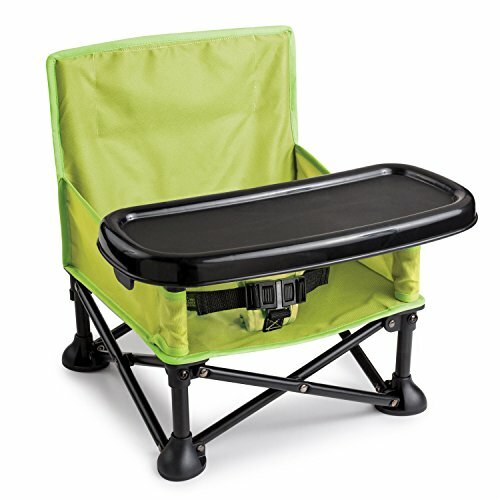 These types of portable chairs are suitable for children up to 37 pounds, and add a great deal of convenience to your dining experience. It should be noted that these chairs depend entirely upon the integrity of the table being used, so it’s always necessary to check the strength of the table. These seats are designed to be incredibly lightweight and easy to take on the go. Do be sure to always check the age and weight limits before using this seat. Here are some of the features that you may want to consider when purchasing the best portable highchair for you. Whether you want something quite simple, or a chair that is loaded with features, what’s guaranteed when you own a portable highchair is a higher level of convenience when you are on the go. Safety Harness: This is, of course, and incredibly important feature. You will find that most portable highchairs feature a three point harness. This is a sufficient level of security, but it should be noted that most experts suggest the bulletproof 5 point harness for the ultimate in safety. These are really only found on full highchairs. Do make sure that the harness is adjustable to accommodate your child as they grow. Look for rubber or rubber-covered harness straps that can easily be cleaned. Make sure the buckle of the harness is secure enough to hold your wiggling child. Seat Adjustments: Some portable highchairs have seat adjustments, and some do not. It really is a good idea to purchase one that has these adjustments because you never know what height of chair or table you’ll encounter. Some of the more advanced boosters will even recline a bit, but be sure to not feed your baby while they’re in the reclining position as this poses a choking hazard. Tray: Some portable boosters have this and some don’ It can be handy to have a lightweight tray that can be easily removed, but do be sure that your child can’t remove it on their own. The tray should be dishwasher safe, and very simple to take on and off. Some parents prefer a travel booster that puts their child in the right proximity to the table so that no tray is necessary, but this might not be the right idea for a very small child. There should be various tray position adjustments that move the tray back and forth to find the most comfortable proximity for your child. Foldability: This is key when you’re looking for a highchair that provides the easiest portability. The best models will fold for easy storage and carrying on the go. You do want to make sure there is some kind of latching system to avoid accidental folding. This latching system should engage automatically as you open the chair. There should also be a lock to keep it folded for extra safety. Also, look out for anything in the design that could lead to pinched fingers. Attachable Toys: If you purchase a portable highchair with a tray, then you can find some models that come with attachable or suction cup toys. This is a fun little bonus that your child will enjoy, but make sure there are no strings or small parts that may pose a choking hazard. Also, be prepared to clean and disinfect these toys after mealtime. Any feature that can make mealtime more fun for your baby will also make it more enjoyable for you. Owning a portable highchair is a wonderful and convenient way to give your child a safe and comfortable place to dine no matter where you go. Great for families who love to travel, eat out, or go to grandma’s house, carrying a lightweight highchair booster means that you don’t have to lug a full sized highchair around. Ideal for those who are skeptical about the cleanliness of restaurant boosters, portable highchairs give you the ultimate control over where your child sits, and how secure they are in their seat. There are so many portable boosters to choose from, and we explored some of the most popular and trusted on the market. Finding the right chair for you comes down to asking yourself key questions about what features matter most to you, how much you’re willing to spend, and how you’re going to be using the highchair. There are a number of styles to choose from, so also ask yourself what you would find aesthetically pleasing in a portable highchair. Also, there are key safety specifications that you need to look out for, as there’s nothing more important than the safety of the seat that you buy. Other considerations that you want to keep in mind are the degree of portability that you’re interested in. There are some that are so lightweight and foldable that you can practically throw them in your purse, but if you’re more interested in sturdiness and will not travel with the booster too frequently, then you may want to select a chair that has a bit more weight and solidity to it. If the booster is just going to stay in your home, then it’s a fine idea to get one that has key features such as adjustable height, firm harness, removable food tray, and padded seat for extra comfort. If you’re purchasing the booster only for travel, then you definitely want to favor lightweight and streamlined. No matter which booster you choose, you’re going to love the added convenience and peace of mind that a portable highchair will bring. No matter what style, they are remarkably lightweight and so easy to take on the go. It helps to make your baby more comfortable when they can have their favorite chair at mealtime, no matter where they are. Venture out to new restaurants with confidence, have a picnic at a park table, go to a holiday party, and so much more. Because portable boosters are so easy to clean, you’ll never have to be embarrassed again about making a mess of your in-laws’ fine dining chairs. Is it Bad to Feed Bread to Ducks?